"Over the past week, Russian warplanes carried out 468 sorties in the Syrian Arab Republic, including 24 combat missions conducted by long-range Tu-22M3 bombers," Maj. Gen. Igor Konashenkov said. According to the Russian Defense Ministry spokesman, 1,354 terrorist targets have been destroyed in Syria's provinces of Aleppo, Latakia, Hama, Homs, Damascus, Raqqa, Daraa and Deir ez-Zor. Russian long-range aviation thwarted a terrorist offensive in Syrian city of Deir ez-Zor, Konashenkov said. "Long-range bomber aircraft units supported the Syrian government troops defending the city Deir ez-Zor. 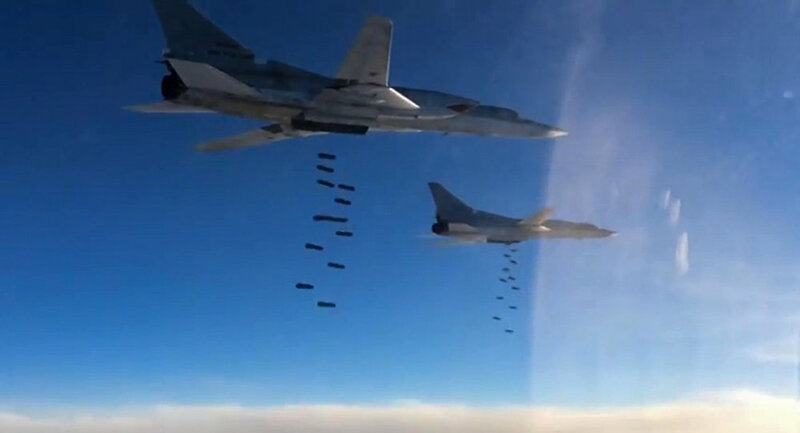 Twenty three major terrorist targets were destroyed in the region as a result of airstrikes conducted by Tu-22M3 bombers flying in from Russia and task air force from the Hmeymim airbase. An attempt of a terrorist offensive in the Deir ez-Zor has been thwarted." 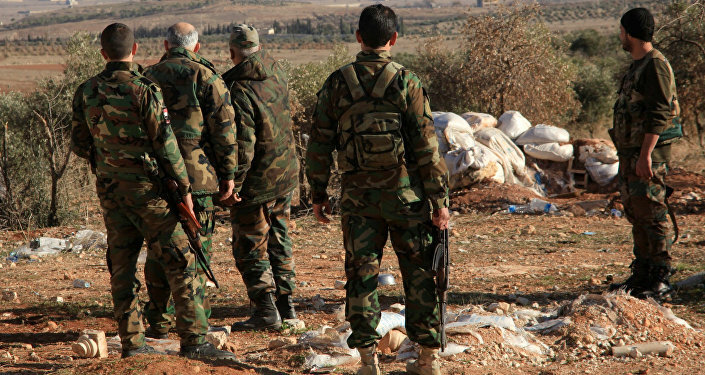 Moreover, Russian aviation foiled a terrorists' attempt to carry out a counter attack against Syrian government troops in the Daraa province. "As a result, 17 off-road vehicles with heavy weapons were destroyed, as well as over 50 terrorists"
Russian aviation destroyed a Jaysh al-Islam militant-controlled fuel depot in the Damascus province, as well as a Daesh-controlled fuel depot in the province of Aleppo, and a terrorist oil refinery in the Daesh's stronghold of Raqqa. "In the region of Jubb Ghabsha in the province of Aleppo, a Su-24M bomber destroyed Daesh terrorist depots with armament and fuel." Daesh has cut militants' salaries by a third due to declining income from illegal oil sales to Turkey, the Russian Defense Ministry said Monday. "Due to a significant decrease in revenues from illegal oil sales to Turkey, Daesh leadership cut militants' payments by a third last week, which has already led to significant problems in recruiting and forming new militant groups," ministry spokesman Maj. Gen. Igor Konashenkov said. Russian jets destroyed a terrorist training camp with fighters from CIS countries who had arrived in Syria via the Turkish territory, he said. According to Konashenkov, "a field terrorist camp with fighters arriving via Turkey from CIS countries was set up, according to information received from members of Syrian opposition." "As a result of a Su-24 airstrike, a field camp, as well as over 20 militants were destroyed," ministry spokesman Maj. Gen. Igor Konashenkov said. He added that the Syrian army continues to advance in montainous Latakia with the support of Russian Su-24M bombers. Peaceful life return to the city of Salma in the Latakia province after it had been liberated by Syrian government forces, he said. Russia delivered more than 200 tons of provisions and medication in January to the Syrian city of Deir az-Zor besieged by Daesh terrorists, Igor Konashenkov said, adding that the aid had been airdropped by Syrian aircraft. As many as 400,000 Syrian civilians have been trapped in the besieged cities of Deir az-Zor, Madaya, Foah and Kafraya for months, suffering from severe malnutrition, according to the United Nations data. Russia has been intensifying all means of reconnaissance in the Middle East to defeat terrorists, Konashenkov added. "In order to increase the speed of revealing terrorist facilities and their exact definition and coordinates, we have increased all types of reconnaissance in the Middle East. This will allow to uncover new militant targets and help in their destruction practically in real time."